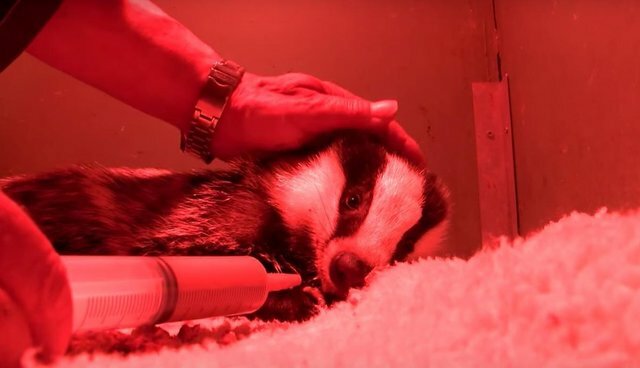 Lucy and Sean, from the Wildlife Aid Foundation, were called out to rescue a badger cub that seemed to be stuck between two fences. In fact, he wasn't really stuck, he was just lying there, extremely thin, weak and exhausted. We suspect something happened to his mum and he was struggling on his own. Back at the hospital, we checked him over. Except for a few fly eggs, he had no injuries. We gave him some "gloop" (a special formula of our own invention, for animals in convalescence), which is liquefied, tasty and easy to lap. It didn't take too long before he dived into the bowl and ate his fill! After some intensive care and feeding, he perked up and went from strength to strength! He has now joined our group of orphaned badger cubs, which will be released this autumn!